Happy Flag Day to you and yours! While I don’t consider myself super patriotic in the conventional definitions, I do feel a great sense of honor and inclusion when I look at our flag. Sure we’ve had a lot of growing pains as a relatively young country and our government’s historical record includes some pretty hefty blemishes, but those aren’t the things we should hold up against the flag. For me, it represents the spirit of the people who live, work and fight underneath its banner. While our government may portray a sense of entitlement, waste resources and get us into unnecessary wars, our flag allows the individuals who keep the country going to have a collective umbrella under which they are bound together. As a kid growing up in Atlanta, every summer I heard Lee Greenwood’s “God Bless the U.S.A.” as Stonewall Jackson, Jefferson Davis, and Robert E. Lee were animated into motion at the Stone Mountain Laser Show. I understood it, but honestly, it was all a little too cheesy and glossy for me. 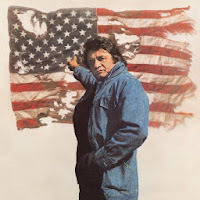 However, there is one man who knows how to celebrate the flag with honesty and authenticity.